One of the ambitions of nanotechnology, building motors on a molecular scale, has been realised by scientists in America. 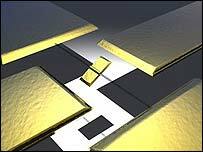 Researchers at Berkeley at the University of California created the world's smallest electrical device earlier this year - one hundred million of which could fit on the end of a pin. The motors finally realised one of the visions of the 'prophet' of nanotechnology, Richard Feynman. His 1959 talk, There's Plenty Of Room At The Bottom, is seen as the foundation script of nanoscience. "He issued a series of challenges to really jumpstart the field of science that would ultimately be called nanotechnology," nanoscientist Mike Roukes of the California Institute of Technology told BBC World Service's Discovery programme. "One of the challenges was to build a motor. He envisioned mass production of miniature motors, far smaller than the scale that anyone could possibly assemble by hand. "This ultimately was realised some 40 years later in the field of micro electrical mechanical systems." Nanotechnology promises to revolutionise medicine, electronics and chemistry. It holds the promise of powerful computers the size of a grain of sand, smart fabrics that could sense the presence of toxic chemicals or nanoscale filters to clean the environment. The lure is of miniature robots that could be powered by nanomotors, although this is still some way off. The motors - the work of Berkeley researchers Alex Zettl and Adam Fennimore - were built using a atom-fine point of a nano-probe, inserting the circuits into place on a silicon chip. The motor sits in the middle of a silicon chip four millimetres square. The motor itself is much, much smaller - the shaft is a half a tenth of a thousandth of a millimetre thick. "The axle element is about 20-40 nanometres in diameter, and that's really the part of the motor that enables it to spin," explained Dr Fennimore. "We've got a rotor which is about 400 nanometres wide, and then on the outside we've got stators, just like you would have on an electrical motor, which are about a micron apart." The stators are electrodes that give the drive to the motor, and drive it by static electricity. But the key element of the motor is a multiwall nanotube. 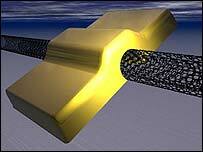 "A multiwall nanotube is graphite wrapped into a tube. Graphite are layers of carbon, like chicken wire," said Dr Fennimore. "A nanotube is if you were to take those layers and wrap them into a cylinder, and a multiwall nanotube is like a leek, in that it's a cylinder within a cylinder." In effect, the nanotubes are shaped like drinking straws, but on a molecular scale. "We're using the inner tube as a sort of axle, and the outer tube as the outside bearing," Dr Fennimore said. "That really is what makes it possible to create this nanomotor." He added that the motor is so small that the researchers do not yet know exactly how it behaves. "It's hard to image whether it's flipping or spinning, and we're still working on trying to resolve that," he said. "We know that it flips back and forth faster than 33 milliseconds because that's the frame rate that we're able to grab them at. "But we still haven't conclusively shown what's going on at the nanoscale."